The app homepage shows your daily progress. One of my favorite Christmas presents was a new fitness band, the Jawbone UP. The band is a “holistic approach to a healthy lifestyle,” according to Jawbone. There are many fitness bands on the market. You have most likely noticed many people wearing a band on their wrist, whether an UP or another popular band, such as the Fitbit Flex. The idea of a fitness band is to help the user track physical activity, sleep patterns, food and more. And as someone who is constantly trying to motivate myself to stay active and healthy, this UP band really helps me stay focused. It’s become fun, interesting, and maybe a little addictive to track my workouts. The band also tracks my sleep patterns (I’m still trying to figure out how), showing how many hours of light versus deep sleep I get each night. You can track your food and moods via the app, although I never track my food (too tedious). If you’re looking for motivation, you can form teams with other UP users. There is also an alarm and stopwatch feature, as well as a few other nifty features. I’ve had my UP band since Christmas and tracked many steps and sleep patterns. I’ve learned I need to move more during the work days and figure out how to have deeper sleeps! Seriously those are cool features of these health fitness bands. It’s recommended you walk 10,000 steps each day but you don’t realize how challenging that can be in an office setting. Unfortunately I spend a lot of time sitting in meetings. To combat that, I set my UP band to vibrate after 45 minutes of inactivity. When it vibrates during a meeting, I simply slip out if possible for a ‘bathroom break’ to walk up and down the hallway. Not always possible of course, but I figure anything helps. Evening and weekends tend to be better for accumulating steps. My Zumba class, which I already know is a great cardio workout, adds 6,500-7,500 steps depending on the instructor’s song choices (I also keep moving my feet between songs). Of course hiking and geocaching pump up the totals too. When Justin and I hiked several Nevada state and local parks, we averaged more than 20,000 steps in one day! 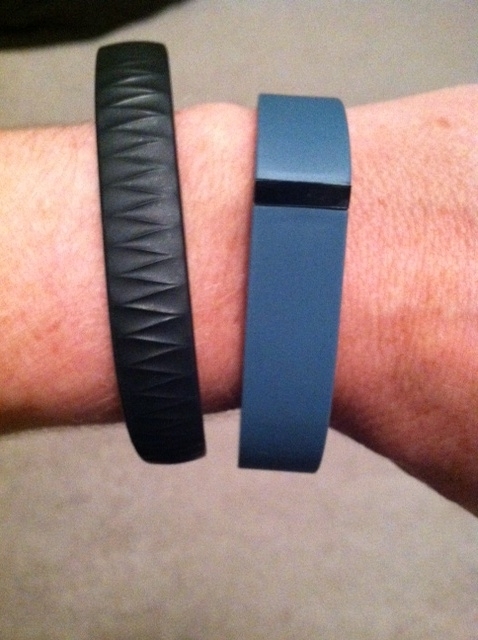 Jawbone UP on left, Fitbit Flex on right. One limitation I don’t like about the fitness bands, regardless of brand, is that it’s challenging to track certain activities, such as biking or weight training. Because there’s no impact with feet or movement with the wrists, very few steps are tracked. I rode my bike 15 miles the other day, only to have my UP band show less than 100 steps tracked. My friend tried putting her Fitbit on her shoe during a bike ride, which garnered more steps but not many. To offset these limitations, you can set the wristband for ‘workout’ mode or use the stopwatch mode, then sync your band to the app to log the activity, duration and effort level for an estimated calorie burn. I like that the app homepage gives short tips and information relating to your use. For instance, my tips sometimes will point out the benefits of getting more consistent deep sleep and tips for getting a better night sleep. 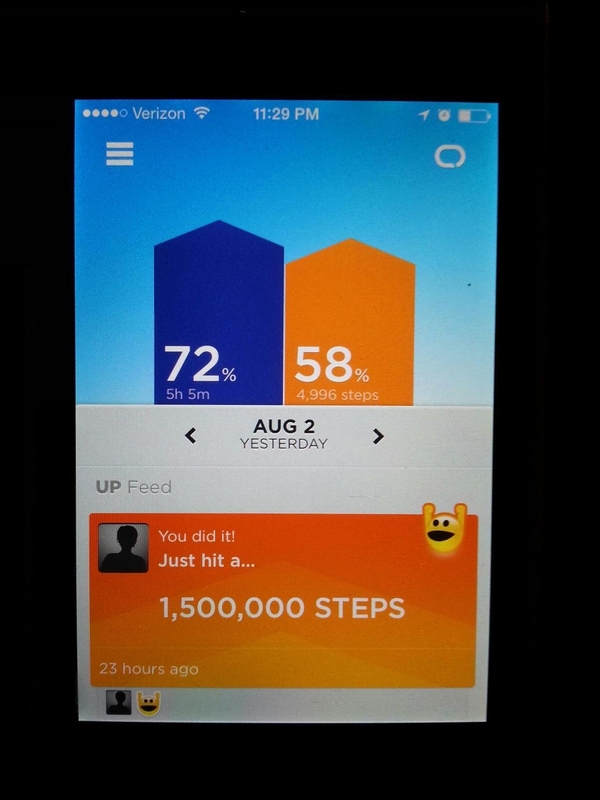 If my average daily step starts to go down, the tips will tell me that and provide ideas for increasing my steps. These positive tips are good motivators for me! The UP band comes in a variety of fun colors and three sizes. Another version of the UP band, the UP24, uses Bluetooth technology to provide real-time updates (the Fitbit Flex also does this). It’s a convenient mode, however, I was concerned about the constant battery drain by always having my Bluetooth feature turned on my iPhone. Do you have a fitness band? Do you like it? What keeps you motivated to stay active and healthy? I’m on the UP too! I hope you’re enjoying the UP too! It’s fun to track your activity. Thanks for reading.